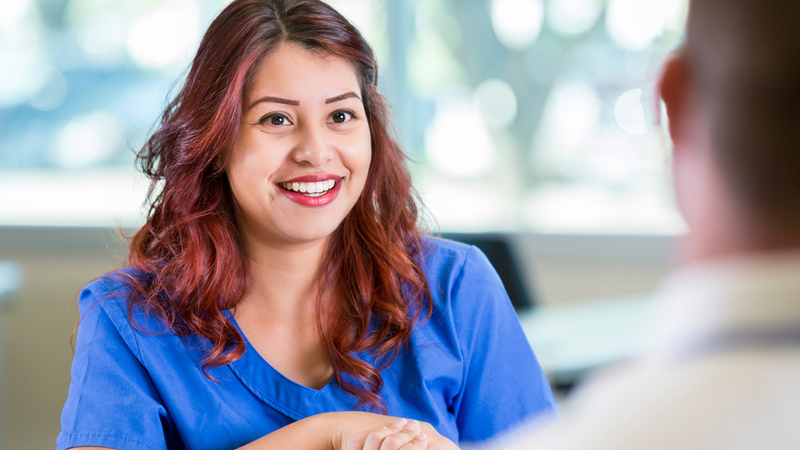 When you sit for a nursing job interview, there are plenty of questions that may throw you off your game, with one having to do with your so-called “weaknesses”. While this question may seem unfair, it actually doesn’t need to be. Let’s explore how you can confidently approach interviews and this commonly vexing question. For every question, the interviewee should consider what the interviewer actually wants to know. You can take questions at face value, but you can also think more deeply about what they’re after. In a best-case scenario, every question should have a purpose, but a lazy questioner may throw some oddball questions from field – we’ll consider this an occupational hazard for both parties. When a question is posed, the first thought in your mind should be, “What do they really want to know?” If they ask about your ability to resolve conflict, they’re wanting to understand if you’re a team player, if you can accept opposing viewpoints, and how you handle difficult interactions using your communication skills. A good interviewer not only examines your verbal responses, but also your body language. Do you look at the ground or the side when responding? (Often seen as a lack of trustworthiness and/or low self-esteem.) Do you maintain eye contact? Are you fidgety? Do your facial expressions match your perceived emotional state? Almost anyone may feel nervous, but if your demeanor makes you appear unprepared or overly anxious, that may not bode well. Be aware of how you use your body, your tone of voice, and how you “read” each question. Ask yourself what they truly want to know, and if there’s an unstated question behind the question. Whatever question you’re facing, remember that an interview is not an interrogation. From this perspective, consider that every question can be responded to in a manner that paints the best possible picture of who you are and what you bring to the table. An interview can be approached as a form of conversational martial arts in which you have the opportunity to reframe questions to your advantage. And in terms of the ever so popular “What’s your weakness?” question, there are various approaches to consider. They’re seeking insight into your self-perception. They want to know where you need to grow and if that fits with their needs and the makeup of the team or unit. They’ll consider if your perceived “weaknesses” are a deal-breaker. You can use this opportunity to apply some conversational judo. Rather than say, “My weaknesses are……”, you can instead say, “The areas where I’m already seeking to grow are…..”, or “My growing edges are….”, or “Areas that I’m working on are….” You then go on to talk about those aspects. The reason we change the language from “weakness” to “growing edge” or something similar is that you can play the interview game just as well. Not repeating the word “weakness” reframes the question positively, which you always want to do -- this may be a subtle art, but it can have the effect you want. To borrow a term used in politics, you can “spin” any question in a positive direction based on how you tackle it, and this can be a very winning strategy for acing commonly troubling interview questions. A successful interview isn’t about people-pleasing; rather, it’s about self-advocacy and painting the most positive picture of yourself possible. Use positive language and body language, an upbeat demeanor, and become good at “spinning” your answers in the direction you want them to go, and you’ll do fine with difficult questions that would otherwise throw you off in the past.